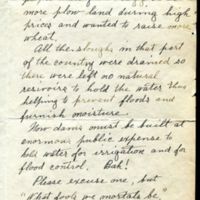 Letter from Laura Ingalls Wilder to Winfield, Kansas children's librarian Helen Crawford regarding the draining of Silver Lake, sloughs and springs, and later construction of dams. 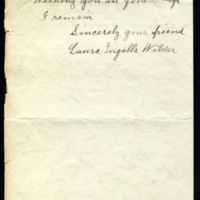 Wilder, Laura Ingalls, “1947 January 23 : letter to Helen Crawford,” Digital Winfield, accessed April 21, 2019, https://winfield.digitalsckls.info/item/8. Your note and the clipping were appreciated even though they have been neglected and I thank you for both. 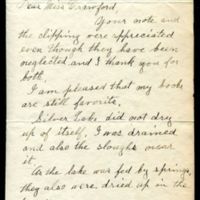 I am pleased that my books are still favorit[e]s.
Silver Lake did not dry up of itself. I[t] was drained and also the sloughs near it. As the lake was fed by springs, they also were dried up in the process. so much beauty was wantonly destroyed, I was told that the people had gone crazy over more plow land during high prices and wanted to raise more wheat. All the sloughs in that part of the country were drained so there were left no natural resivoirs [sic] to hold the water thus helping to prevent floods and furnish moistures. New dams must be built at enormous public expense to hold water for irrigation and for flood control. Bah! Please excuse one, but "What fools we mortals be."